Also serving communities of Walnut Creek. The average cost of assisted living in Dover is $2,700 per month. This is lower than the national median of $3,346. To help you with your search, browse the 14 reviews below for assisted living facilities in Dover. On average, consumers rate assisted living in Dover 4.2 out of 5 stars. Better rated regions include Massillon with an average rating of 4.7 out of 5 stars. Dover, Ohio, is one of the few places left that has an authentic drive-in movie theater of the type that used to be everywhere in the '50s. Seniors from the area's seven assisted living communities can plan friendly or romantic trips there as part of an independent and active senior living plan. 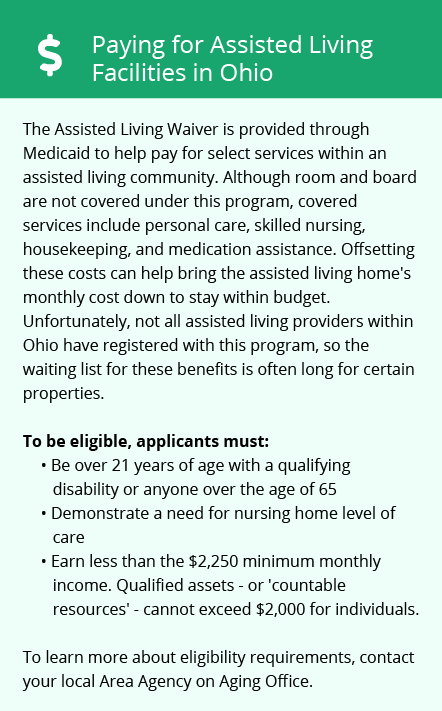 The Ohio Department of Health’s Office of Health Assurance and Licensing encourages this kind of independence, and it publishes guidance for assisted living staff in the state for how to facilitate it. Many staff members further support their residents with 24-hour care and assistance with activities of daily living (ADLs), such as meal prep and personal care. As part of the Cleveland area, Dover enjoys mild summers and snowy winters. July temperatures here get up to 83 degrees Fahrenheit, and December lows dip to 22 degrees Fahrenheit. This can cause problems for seniors with COPD or other respiratory issues. Dover gets around 39 inches of rain in a typical year, as well as 68 inches of snow. The cost of living in Dover is a bit lower than it is on average nationwide. Seniors who buy their own groceries can pay just 97 percent of the usual price in America. Aging citizens who cover the cost of their own health care can expect to pay 99 percent of what their care costs elsewhere. Ohio charges a state tax on most forms of income that runs from 0.495 to 4.997 percent. Local communities in Ohio may also charge between 0 and 3 percent tax on wages and other earned income. Most retirement income and SSI are exempt, however, which helps seniors with retirement planning. Crime in Dover is extremely low. None of the major categories of crime get higher than one-quarter of the national rates. Tuscarawas Coordinated Public Transportation (TuscTransit) is a grant-funded public transportation provider that provides door-to-door shuttle service for adults with disabilities and seniors who need a lift around Dover. Routes are scheduled in advance, which many assisted living community trip planners are able to help with. The Dover area is home to world-class medical facilities, including Cleveland Clinic Union Hospital, in the event of medical emergencies or illness. Assisted Living costs in Dover start around $2,700 per month on average, while the nationwide average cost of assisted living is $4,000 per month, according to the latest figures from Genworth’s Cost of Care Survey. 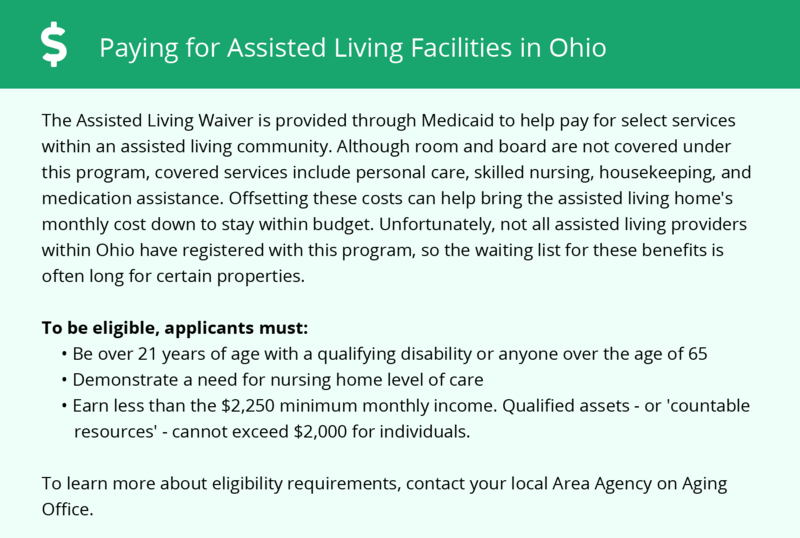 Ohio offers seniors an Assisted Living Waiver program that helps aging citizens pay for assisted living, as well as a residential state supplement. To see a list of free assisted living resources in Dover, please visit our Assisted Living in Ohio page. Dover-area assisted living communities must adhere to the comprehensive set of state laws and regulations that all assisted living communities in Ohio are required to follow. Visit our Assisted Living in Ohio page for more information about these laws.